Below knee amputation (transtibial amputation)is by far the highest incidence of all amputationsand can be a result of disease (such as diabetes and other related vascular/circulatory conditions), trauma, infection, tumors (cancer) or congenital abnormalities. As the anatomical knee joint is still present, below knee amputees generally regain very good mobility and can often return to active and relatively normal lifestyles. As there is no prosthetic knee joint component needed, the cost of a below knee prosthesis is also significantly lower, compared to an above knee amputation. There are many different socket designs, suspension systems (for attachment of the prosthesis) and prosthetic feet designs that can be selected from. The role of the prosthetic practitioner is to guide each patient in the most ideal selection of options, within each patient’s relevant budget. 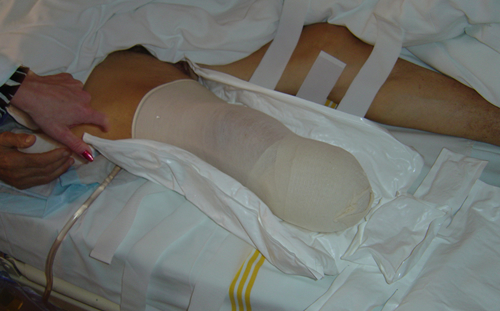 After the formalisation of the amputation, a compressive dressing or rigid dressing will be applied immediately after amputation to prevent swelling of the residual limb (stump) tissues. Controlling swelling is important as swelling of the soft tissues causes pain and can result in the suture site and stitches being put under undue tension. Residual Limb – immediately post-operatively. The suture line visible at front where muscle and skin is attached to form a soft tissue pad over the bone. 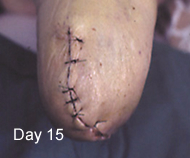 A wound dressing bandage is placed around the limb – the rigid dressing underneath the limb about to be closed. The rigid dressing applied. Air is sucked out of the rigid dressing, causing it to compact and rigidify. 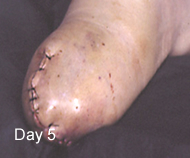 After approximately 7 – 10 days, the wound dressing and compression dressing will be removed. 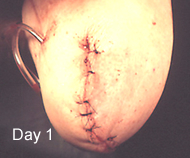 The sutures can often be removed after approximately 14 days, depending on the suture site healing. For diabetic or vascular insufficiency patients, the healing may take a little longer. It therefore speeds up the rehabilitation process. 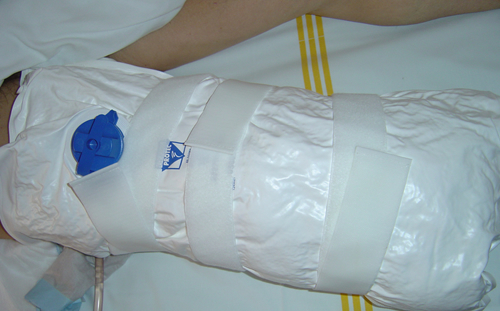 Compression therapy can be done by means of elastic bandages wrapped around the residual limb, or better, by means of silicone compression liners. The silicone liners are easier to apply and give consistent graduated compression (higher at the bottom – gradually getting less to the top). 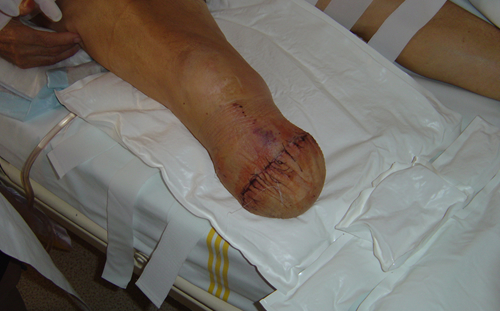 Post-Op compression silicone liner. 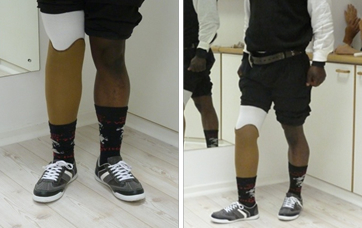 Graduated thickness allows graduated compression – more at bottom, gradually less to top. The compression therapy liners are applied in a graduated compression therapy protocol where the silicone liner is used for slightly longer periods of time each day. 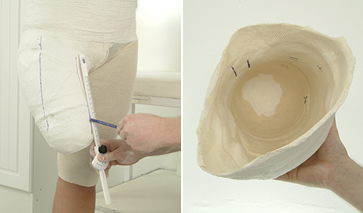 As the residual limb volume and shape reduce, a smaller size compression liner is applied. 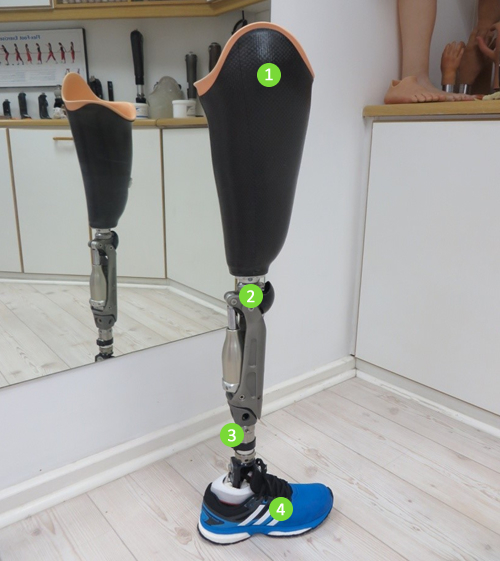 This process is repeated until the Prosthetist is satisfied that the volume and shape of the residual limb is suitable for the fitting of a diagnostic socket. The diagnostic socket can serve as an interim prosthesis for short term use to help further shape and reduce the volume of the residual limb. As the name implies, the diagnostic socket also serves to help determine any socket fitting problems, areas of residual limb discomfort and the correct alignment of definitive prosthesis. Taking measurements and casting the residual limb to manufacture the prosthetic socket. 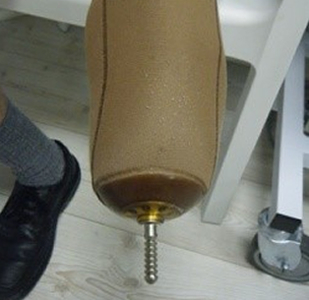 Below Knee Prosthesis with ‘’Diagnostic Socket’’ to determine comfortable socket fit and correct dynamic alignment. Once the residual limb volume and shape has stabalised, the definitive prosthesis can be manufactured. The correct alignment of the diagnostic or interim prosthesis can be transferred to the definitive prosthesis. 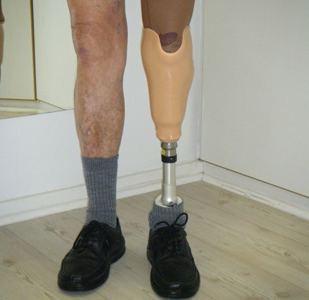 The prosthetic components used in the diagnostic prosthesis (such as the foot, suspension lock and other attachment components) can be used in the definitive prosthesis. It is therefore simply a replacement of the prosthetic socket. If the patient desires a cosmetic cover for the prosthesis, it will be the final procedure in the completion of the definitive prosthesis. This can be a simple foam shaped cosmesis covered with a cosmetic stocking, a basic silicone ‘’skin’’ or a high definition silicone "skin" cover that matches the skin colour, skin profile, toes and nails of the contra-lateral limb. Above knee amputation (Transfemoral amputation)has the second highest incidence of amputation after below knee amputation and can be a result of disease (such as diabetes and other related vascular/circulatory conditions), trauma, infection, tumors (cancer) or congenital abnormalities. 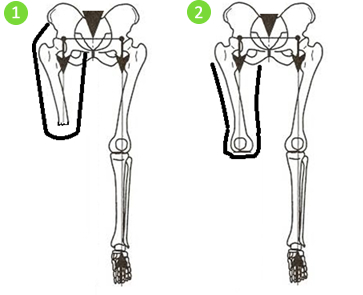 Above Knee amputees can regain reasonably good mobility, depending on the height of the amputation, therefore, the remaining length of the residual limb (stump). The longer the residual limb length, the stronger the lever arm and prosthetic control. Long above knee residual limb. Very short above knee residual limb. 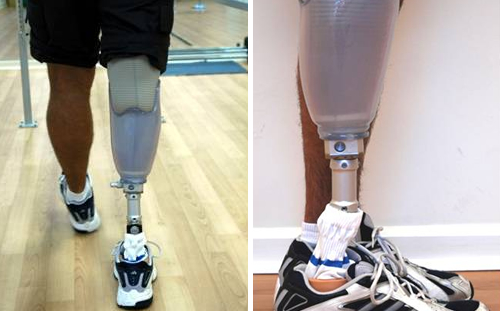 Irrespective of the cause of amputation, after amputation is performed, the prosthetic fitting, rehabilitation process and prosthetic componentry remains essentially the same. 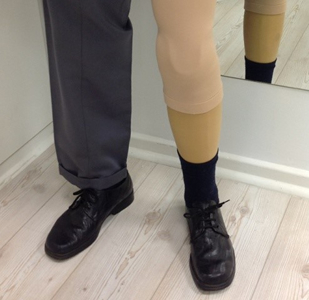 In modern prosthetics, most above knee prostheses are suspended (attached) by means of a silicone liner that is rolled onto the above knee residual limb and then enters into the prosthetic socket. 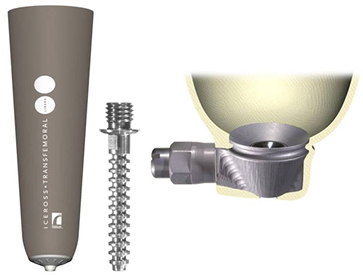 The attachment between the silicone liner and the prosthetic socket can be mechanical (a pin and lock system) or by means of suction (air expelled through a one-way valve). There are many advantages to suction liner systems and they have by far the highest incidence of use. Plaster-of-Paris is wrapped around the residual limb and allowed to set. Some alignment reference lines are marked. The inside view of the plaster negative mold on the right. Shaping of the plaster residual limb model is one of the most important steps in the successful and comfortable fitting of the above knee prosthesis. The socket is literally the ‘’foundation’’ of the prosthesis. This is where the Proshetist’s skill and experience is of vital importance. 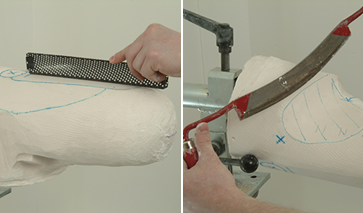 The plaster model is carefully shaped with special prosthetic tools to optimally fit the residual limb. It has to apply pressure in certain areas and alleviate pressure in other areas. It is also important to be shaped to control and prevent rotation of the prosthesis on the residual limb. A clear, plastic diagnostic or ‘’test’’ socket is fitted to determine correct fit of the prosthetic socket and identify any areas that need adjustment. The diagnostic socket can be fitted to the remaining prosthesis components so that the socket fit can also be assessed during walking. The optimal alignment of the prosthesis can then also be determine. 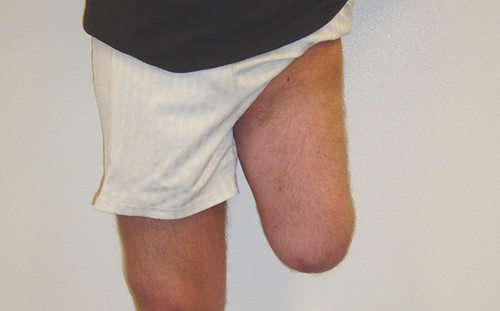 The Through Knee amputation is the third most common level of amputation of the lower extremities (after below knee and above knee amputations). It is performed when a below knee amputation is not viable, generally where the tissues is damaged or diseased too close to the knee joint that would result in a very short below knee amputation, posing prosthetic fitting problems. 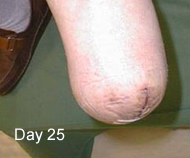 Through Knee Prosthesis without cosmetic cover. 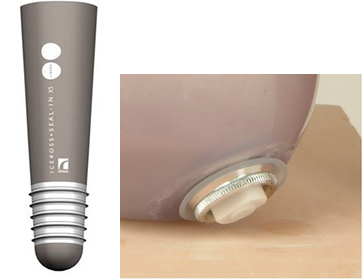 Through Knee Prosthesis with high definition cosmetic cover. As the femoral condyles are still remaining, they can support partial weight bearing in the prosthetic socket. The prosthetic socket therefore does not have to go as high up to the buttock and ischial bone (sitting bone) as with the Above Knee socket, generally making prosthetic socket fit and especially sitting, more comfortable. It leaves a very long residual limb, therefore a long lever arm for good prosthetic limb control. Amputation done through the shaft of the femur bone. Amputation done through the knee joint – leaving the round femoral condyles. The main disadvantage of the Through Knee amputation is that the knee center’s (or axes) of the prosthetic knee and sound limb knee is not equal, due to the fact that the socket materials, attachment components and structural build height of the prosthetic components takes up space – effectively placing the prosthetic knee joint axis lower than that of the sound limb knee. This causes the through knee prosthesis knee joint to extend further forward from the sound side limb when the amputee is sitting.  It is therefore a predominantly cosmetic consideration. The functional advantages of the through knee amputation and prosthesis far outweighs the cosmetic compromise when sitting. The prosthetic knee can be seen extending further forward than the sound limb knee when sitting down. 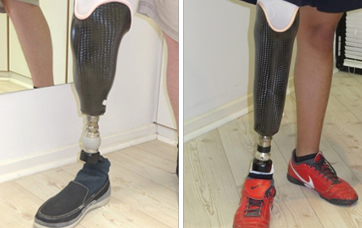 The rehabilitation process, prosthesis manufacturing (casting, socket manufacture and fitting, as well as alignment) is the same as discussed under above knee (transfemoral) amputations. 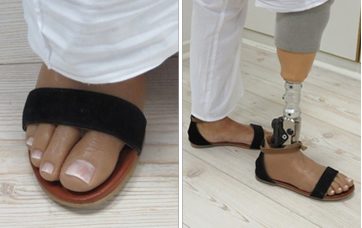 Only the prosthetic socket principles and design are different.